I created this ad for the University of Texas Baptist Student Ministry. 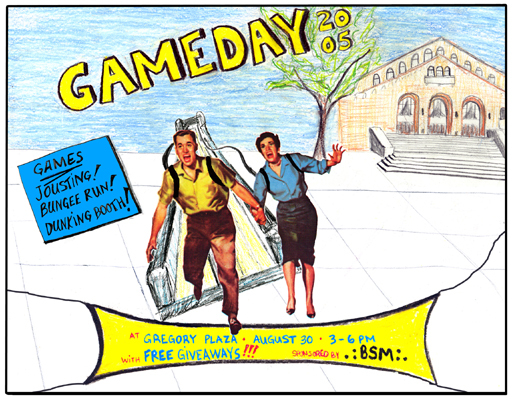 The goal was to advertise this on-campus event and increase name recognition for this student organization. 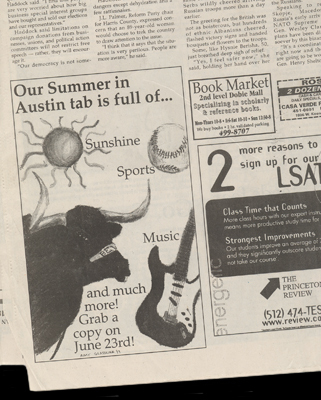 I created this illustration for an ad in the Daily Texan Newspaper in June of 1999. 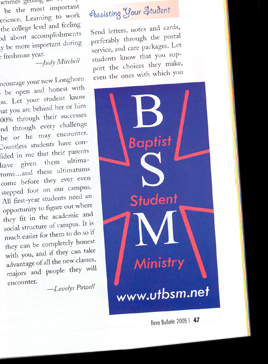 I created this Ad for the University of Texas Baptist Student Ministry. The goal was to increase name recognition of this student organization and increase traffic on their new web site. 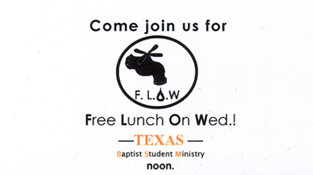 The ad was published in the Bevo Bulletin, (vol 7, 2005, page 47.) an on-campus publication. I designed this ad in card form so that students could easily invite their friends to this weekly event. This is an ad I made for Bazooka while in the Advertising Creative sequence at the University of Texas at Austin. I used Photoshop, Quark, and Illustrator. The idea was to express fun and attach this feeling to the brand through fun pink images, therefore making this gum synonymous with fun.